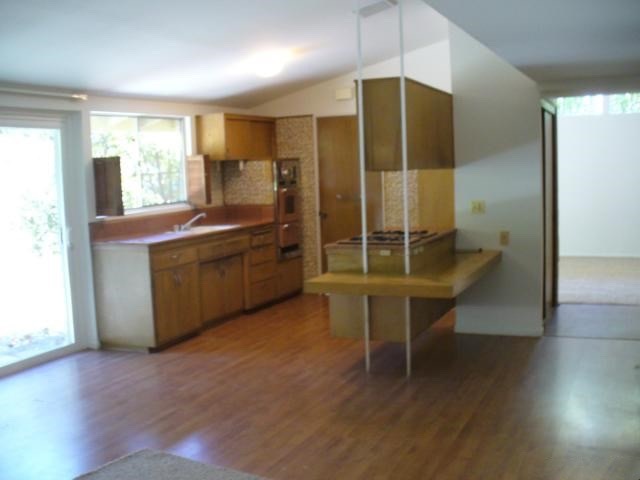 Originally built in 1956, this home is now being marketed for the first time in over 50 years! This Mid-Century Modern home, nestled in the foothills facing south, has been lovingly maintained by the same family. Offering tremendous potential, starting with a center hall style entry, living-room with high ceiling and fireplace. The open concept kitchen/den combination offers wood laminate flooring, tile counters, breakfast bar, and gas appliances. Sliding glass doors provide easy access to outdoor entertaining. There is a master bedroom with three-quarter bath attached, two bedrooms with Jack-n-Jill style bathroom access. The 4th bedroom is spacious and was previously used as a family room.This is an inviting floor-plan waiting to be transformed!